As a child growing up in Newport Beach in the early 1960s, I considered myself lucky to live in the same county as two of the best places imaginable. Disneyland was for special occasions; perhaps we went once each year, usually when we had guests visiting. But Knott’s Berry Farm was a place we could visit often. There was no gate admission in those days. In fact, there was no gate. Fashion Island in Newport Beach and South Coast Plaza in Costa Mesa hadn’t been built yet. My mom didn’t have a driver’s license. When she wanted to go shopping for clothes, my dad would drive her to Santa Ana Fashion Square or Anaheim Plaza. After dropping her off, my dad and I would spend the afternoon at Knott’s. My dad and I must have explored every square inch of Knott’s—Old MacDonald’s Farm with its piano-playing chicken, the blacksmith bending red-hot iron, the world’s smallest television at Mott’s Miniatures, the models of the California Missions, the talking mynah birds, the rocks that glowed under ultraviolet light, the sea lions that begged for fish, the volcano operated by the little mechanical devil, the peek-in dioramas of Ghost Town, and all sorts of other details. We discovered something new at every visit. And most of it was free. 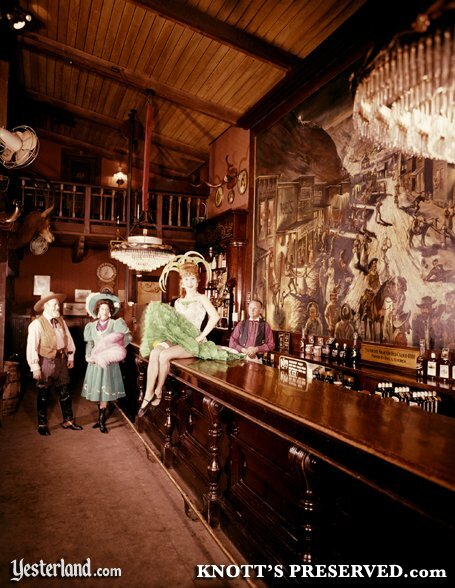 Then we’d pick up my mom at the mall, go back to Knott’s, have dinner at the Ghost Town Grill, and listen to the Wagonmasters perform at the Wagon Camp. Sometimes we went to the Bird Cage Theatre for an old-fashioned melodrama followed by variety acts. But usually we just drove home on Beach Boulevard, where the farms were giving way to suburban growth. Over the years, I watched Knott’s Berry Farm evolve. At first I was disappointed when Knott’s began to charge a dollar for admission in 1968. 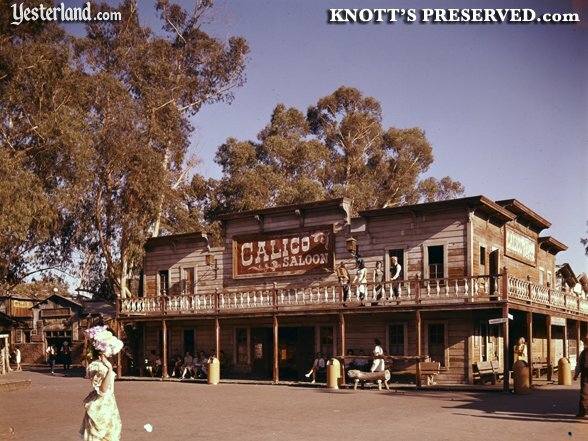 But that’s when Knott’s began to evolve from a Ghost Town area surrounded by a hodgepodge of concessions into a true theme park with well-designed lands, new attractions, and more entertainment. “But, wait!” you say. This article is supposed to be a book review, not a nostalgia essay by a baby boomer. Fair enough. Let’s talk about the book. I had the privilege of reading an unbound proof copy of Knott’s Preserved: From Boysenberry to Theme Park, The History of Knott’s Berry Farm. Artist and theme park designer Christopher Merritt began work on this book around 15 years ago. I’ve known about the project for around ten years, primarily from things I read on the Internet. In recent years, I’ve traded e-mail notes with Chris Merritt asking about the status of the book. (He would say he was still working on it, but very busy with something else.) J. Eric Lynxwiler, the co-author of a terrific book about Wilshire Boulevard, joined Chris as co-author of the Knott’s book. And now, after all these years, the book is at the printer. In two or three months, it will be at book stores. Knott’s Preserved begins with a nostalgic foreword by another baby boomer, Walt Disney Imagineering (WDI) executive Tony Baxter. By the way, Chris Merritt has done a number of projects for WDI, most recently the return of the Sleeping Beauty Castle Walkthrough. 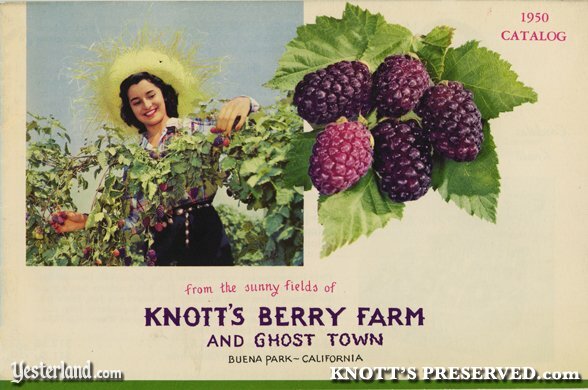 The story of Knott’s Berry Farm begins in 1920, when young farmer Walter Knott and his wife Cordelia came to Buena Park, California. Walter planted blackberries, initially on rented farmland. The basic story is well known. After struggling, Walter found success growing an unusually large berry that he named after Rudolph Boysen, the man who had created and abandoned this hybrid. Meanwhile, to make ends meet, Cordelia had opened a tea room that evolved into Mrs. Knott’s Chicken Dinner Restaurant, one of the busiest restaurants in America, with waits of several hours to get a table. As the size of the restaurant increased, so did the demand for tables. Walter figured out various things to keep guests happy while they waited, including an Old West street that he began in 1940. Concessionaires added rides and shops. What had once been an actual farm became a farm in name only. 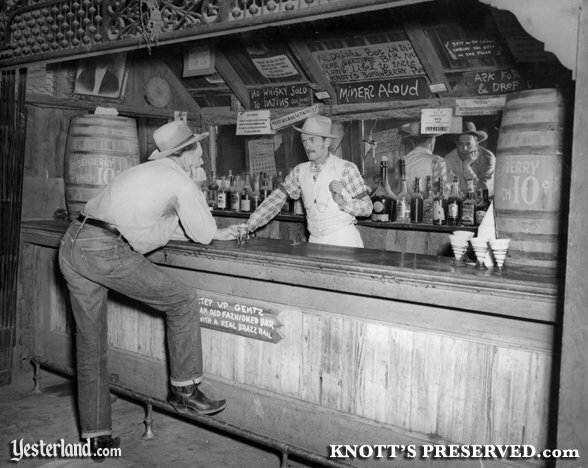 Knott’s Preserved tells the Knott’s story from 1920 until the present. It’s clear that an awful lot of research went into this book. Although it’s not a biography, we learn about Walter and Cordelia Knott as more than just faces on pictures at the park. Wendell “Bud” Hurlbut finally gets recognition in a book. Hurlbut was not only the creative force behind a number of Knott’s rides, including the masterpieces—the Calico Mountain Mine Ride and the Timber Mountain Log Ride—he owned them. An example of two pages from Knott’s Preserved: an attractive layout, square pages, and many illustrations. The book contains around 200 images, including historic photos, concept renderings, and well-chosen artwork. There’s a good balance between pictures and words, with each occupying somewhere around 50% of the total page space. 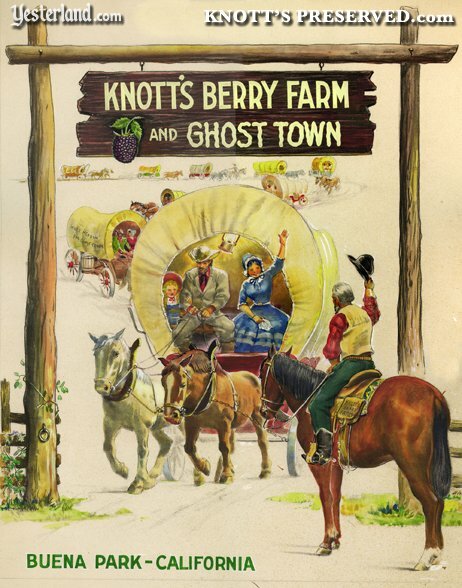 Whether you remember Knott’s Berry Farm as the Knott family business, or you only know the Knott’s Berry Farm of recent years, the road from 1920 to today is fun and fascinating. 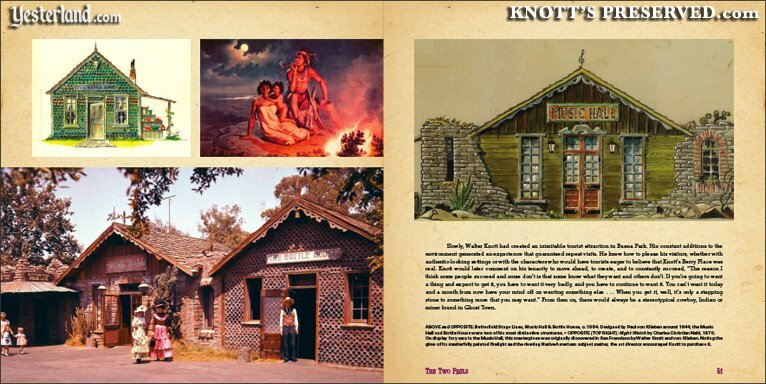 In fact, I recommend Knott’s Preserved to anyone interested in theme park history and design. Oh, because every article at Yesterland has something to do with Disneyland, Walt Disney World, or Walt Disney, I need to mention that the book includes a number of stories involving Walt Disney. 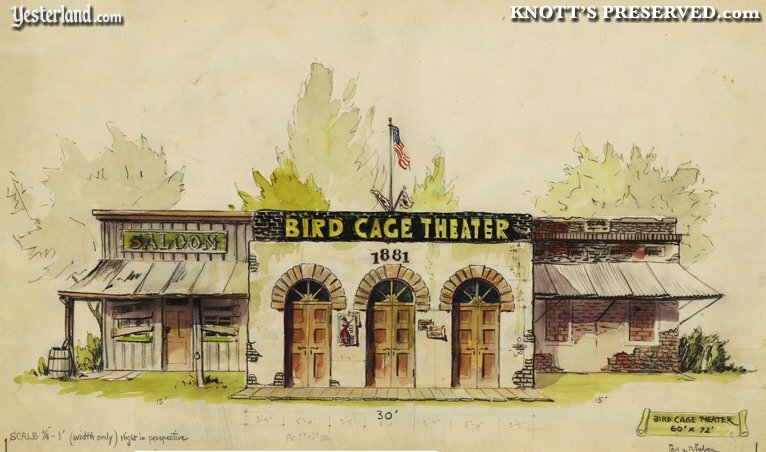 Concept rendering for Bird Cage Theatre façade. CHRISTOPHER MERRITT is an artist and designer working in the theme park industry. His notable projects include serving as art director for the 2008 Sleeping Beauty Castle walkthrough at Disneyland, and as a concept and show designer for various attractions at the Disney theme parks. He is an art director for the Dreamworks Zone at Universal Studios Singapore. Lucky enough to grow up in Southern California, he visited Knott’s Berry Farm and Disneyland throughout his childhood. J. ERIC LYNXWILER grew up in Southern California and spent one school year working at Knott’s Berry Farm’s shooting gallery while earning his degree in urban anthropology at UCLA. Popular host of Los Angeles’s renowned Neon Cruise and board member emeritus of the Museum of Neon Art, Lynxwiler co-authored the celebrated book Wilshire Boulevard: Grand Concourse of Los Angeles. AMY INOUYE designs books, makes funny art projects and is “mom” to Chicken Boy, a twenty-two-foot fiberglass man/boy with a chicken’s head (aka the Statue of Liberty of Los Angeles). A graduate of Art Center College of Design, she lives on Historic Route 66 in Los Angeles. 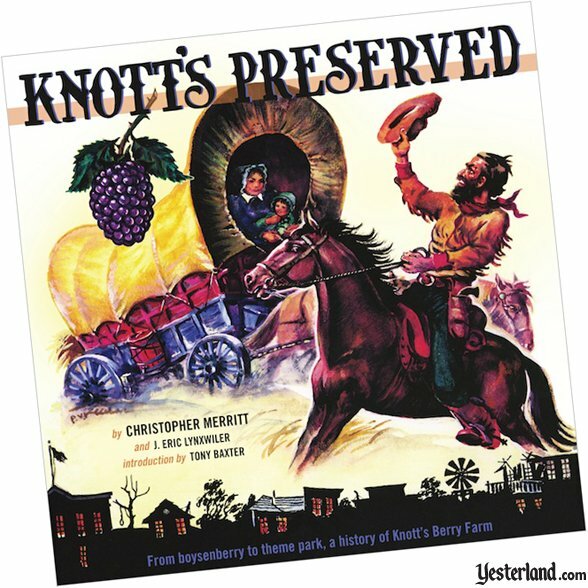 The original edition of Knott’s Preserved, described in this review, is out of print and sold out. It is available through Amazon and other sellers of used books and collector books—but often at sky-high collector prices. There’s good news now! Authors Christopher Merritt and J. Eric Lynxwiler and publisher Angel City Press have released a 176-page revised and expanded second edition. Directly from Angel City Press. Knott’s Preserved book cover: © 2010 Christopher Merritt. 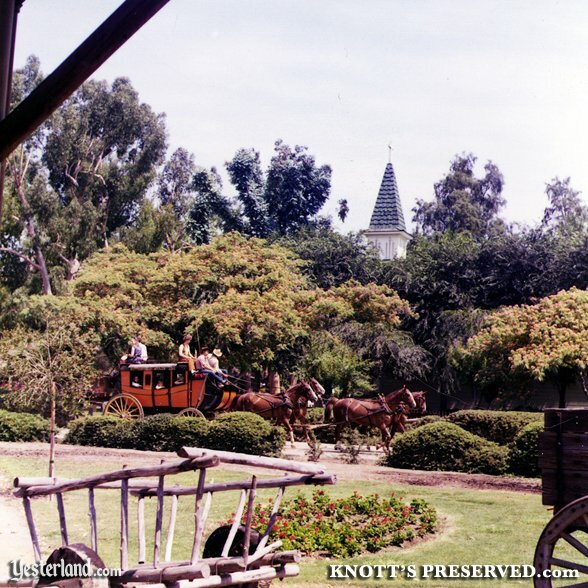 Historic images of Knott’s Berry Farm, courtesy of Christopher Merritt. Disclosure per FTC guidelines: This is a book review of Knott’s Preserved. Werner Weiss received an unbound proof copy of the book for this book review. Mr. Weiss does not receive any financial consideration from Angel City Press or the authors.